In this episode, I interview Billy Gene Shaw, a Facebook and YouTube marketing expert. His agency helps businesses acquire customers. He’s also the founder of the School of G.E.N.E.I.U.S. Billy Gene provides tips for creating attention-grabbing pre-roll ads and offers that compel viewers to click a call to action. 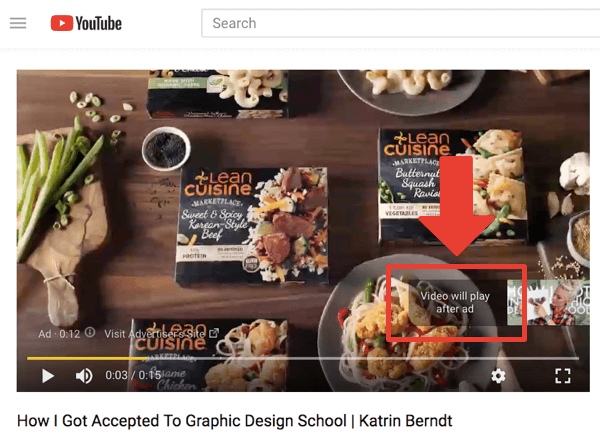 You’ll discover how to serve YouTube pre-roll ads via a specific video, topic, or location. 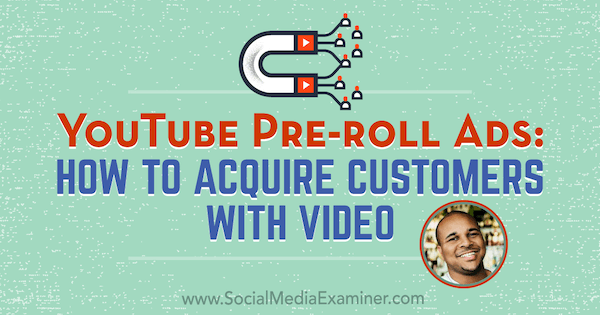 YouTube Pre-Roll Ads: How to Acquire Customers With Video featuring insights from Billy Gene on the Social Media Marketing Podcast. When Billy Gene was at a professional low, he was making cold calls all day, selling online education from a university he didn’t believe in. After he found out the company’s CEO made $25 million a year in online business, he quit the next day. Billy Gene called one of his buddies who had just inherited some money and said, “Dude, we need to figure out something about this online stuff.” Long story short, they discovered Facebook ads and Billy Gene saw and fell in love with the possibilities. This was in 2012 and 2013, when Facebook ads appeared only in the right column, not in the news feed. Over the last few years, Billy Gene has worked with a lot of franchises like Massage Envy, Kia Motors, and Orange Theory Fitness. His agency helps them get more customers. Billy Gene’s agency works with franchises, many in health and wellness. When a company hires his agency, they want results, Billy Gene explains. They don’t want a new website or organic posting. They want one thing: more money than what they’re spending working with him. If you can bring a business three times the revenue you cost them, those relationships last a long time. Listen to the show to hear Billy Gene list his basic tools for attracting customers in an automated and predictable way. What Are YouTube Pre-Roll Ads and Why Use Them? When you’re on YouTube looking to be entertained, the pre-roll video is the one that pops up before your video. The ad isn’t what you searched for and you can’t skip it for the first five seconds. These ads are also called in-stream ads. Billy Gene spends a lot of money on advertising across several platforms: Facebook, Instagram, billboards, podcasts, and so on. In 2017, he believes YouTube is the most profitable, easiest, fastest, and most affordable way to get customers. If you’re not using YouTube ads, you’re missing out on a giant opportunity, he says. YouTube is the easiest and most affordable way to acquire customers. Everyone is Facebook-centric these days. People are finally becoming hip to social media and they start with Facebook. Because there’s a bigger barrier to entry with video on YouTube, it’s much less competitive. Both platforms use a bidding system, and where there are more people it’s more expensive. Plus, Facebook is increasing prices, especially with the holidays coming up. When the market zigs, you should zag. YouTube is the zag, which is why it’s so profitable right now. Plus, it gives you the opportunity to physically be in front of your customers. Seeing someone’s face, watching their body language, and taking in their environment build a level of trust that you can’t do with an image. Listen to the show to discover what prevents people from doing YouTube ads. As an example of what YouTube ads can do, Billy Gene talks about an ad promoting his membership site. Members pay about $100 per month, and he teaches a new skill each month. For the first year, he reached about 300 to 400 members using only Facebook ads. Beginning this year, he switched to YouTube ads and membership grew to 2,700 members without talking to anyone on the phone. The YouTube ad is the same as the Facebook ad, but has just worked better. Sometimes simply changing your ad campaign’s traffic source leads to a home run. 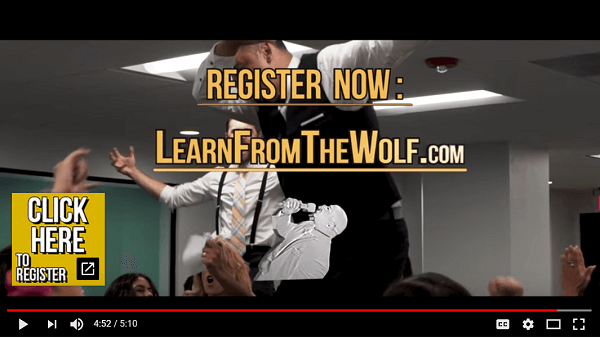 Billy Gene’s ad is a creative parody of The Wolf of Wall Street. The video has a simple message: If you’re an entrepreneur, register for training and learn how to use ads like this to turn clicks into customers. When Billy Gene switched his video to YouTube ads, his membership grew. Clicking the ad takes people to the training registration page. After they enter their name, email, and phone number, they’re redirected to the video training, which is about 40 minutes long. 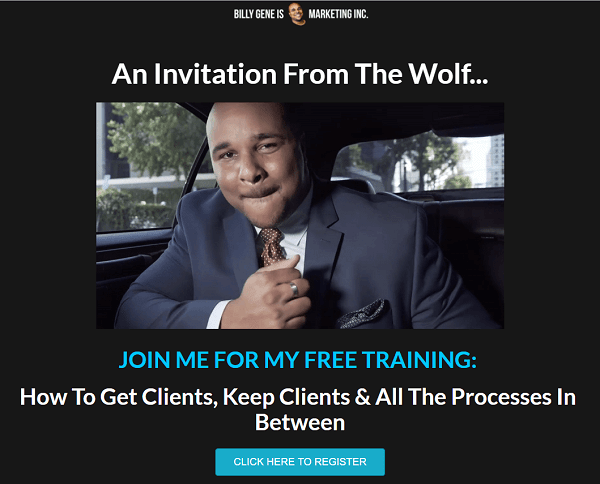 At the end, Billy Gene makes them an offer that says, “Do you want to sign up for my membership site?” He also gives them a free course. The campaign is simply an advertisement, a landing page, and an offer. The approach is not magic. The targeting is on-point, the message is good, and it’s something that can be replicated. Billy Gene’s video campaign leads to a landing page, where he collects users’ information. Billy Gene emphasizes that his follow-up on the ad is huge. Via email, they follow up with those who don’t buy with case studies, other training, and so forth. However, the biggest thing for conversions is sending a follow-up text message. Billy Gene’s team uses a service called Twilio, which is integrated with their ClickFunnels landing page. Twilio sends an automated text message about an hour after someone watches the training and asks for their thoughts. This text message starts a conversation and gives prospects an additional link to get more information. For the voice broadcast messages, Billy Gene uses Slybroadcast. To use this service, you simply record an audio message on your smartphone and upload the message. All of these tools will make a huge difference in your business and they’re affordable. Follow up with audio messages using Slybroadcast. Next, Billy Gene shares an example of a local gym. Billy Gene notes that the advertising process is always the same. Start with an advertisement where you offer to solve someone’s problem. People (especially local businesses) don’t realize that when they sell, everyone focuses on their product or service but nobody sells the people. For instance, in YouTube ads for a local gym, Billy Gene sells the people at the gym, because someone’s objections are often related to whom they’ll interact with. Someone who has never been to a gym is wondering who will be training them and who will be there. Similarly, you don’t go to a bar, club, or party unless you know who’s on the guest list. So whenever you want people to come into a new environment, sell your audience on what the experience will be. In the first five seconds of a YouTube ad, you need to grab the viewer’s attention. For the gym, Billy Gene created a two-minute YouTube ad that begins outside the gym. Allen, the head trainer, runs up to the camera and says, “Hey, I know you’ve been pushing off starting your fitness journey, but guess what? That changes right now. Come with me.” Then Allen turns around and starts walking into the gym. When someone walks away from you, you have no choice but to be like, “Wait, hold on a second.” The camera follows him and brings the audience on this journey. When Allen gets into the gym, a half-circle of gym members say, “One, two, three, hey!” It gives the video audience a big welcome. The experience prompts the viewer to think, “Holy cow, these people are actually talking to me.” Break down the fourth wall in your YouTube ads, Billy Gene suggests. People know they’re being advertised to, so address the elephant in the room. Next, viewers see a workout demonstration, and Allen makes an offer to the viewer to come to the gym for free. The offer goes to a capture page for name, email, and phone number. He asks them to come into the gym and sells a membership. Listen to find out why I like the motion videos offer. The first five seconds is everything, Billy Gene reiterates. For instance, run up to the camera, duck, or move to the side and step into frame. One of their most popular videos is where Billy Gene is crouching, and the camera is just sitting there. Billy Gene jumps up and says, “Hey, didn’t see you there.” It’s really silly and it works. The three-tool framework everyone can use is props, environment, and music. Use props to really grab attention. Get something oversized, like an oversized card, box, or something else people would not typically see. Find something from your industry that would look weird. Also, use your environment. Change where you are. If you’re on a roller coaster, take out your camera and shoot a YouTube ad. Because who makes a video while on a roller coaster? When you change your environment, it attracts viewers’ attention. Last is music. Go through music databases such as AudioJungle and Artlist.io that allow you to search by emotion. For example, type in “sad,” and you’ll get thousands of songs that feel kind of sad. Or search for “mad,” “angry,” “happy,” “silly,” “electronic,” “scary,” or whatever emotion you’re trying to capture. Buy and download audio (long and short songs, sound effects) for maybe $5 or $7, depending on the piece, and put the music into any video you create. You can use them license-free, so you don’t have to worry about your video getting yanked. When putting emotion into your videos, play to your strengths. As an example, Billy Gene emphasizes his humor so he sometimes uses silly music. It’s his personality. However, if he’s talking about a serious topic for a client, he’ll choose something more appropriate to the situation. Just be sensitive to what you’re selling or offering, and keep it congruent. 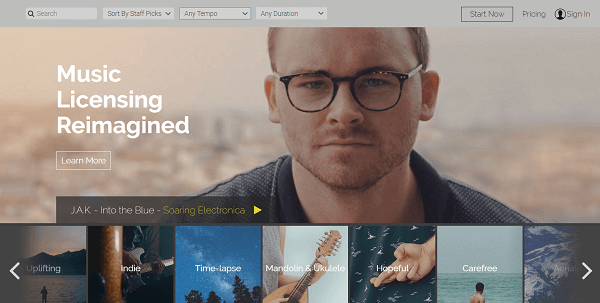 Websites like Artlist enable you to search for music by emotion. Regarding environment, for instance, everybody’s seen a gym a million times. So why not start in the parking lot or the grocery store, and run to the gym, even if it’s like six miles away. Do a time lapse. Speed up the video and make it look hyper-warped. Starting somewhere unrelated in the video intro doesn’t mean you can’t move to the destination. Remember, people on YouTube have already decided to watch something else when they see your pre-roll ad. You’re trying to convince them that what you have is way more exciting. A prop is a way of catching their attention. If you’re walking down the street, you pass thousands of people but someone who has a giant oversized pink water gun is noticeable. Listen to the show to hear the number-one rule of marketing. First, Billy Gene stresses that you can advertise to people based on the videos they watch. A lot of people don’t realize that’s possible. Say you have a cooking product or service, and want to find people who are into barbecuing. 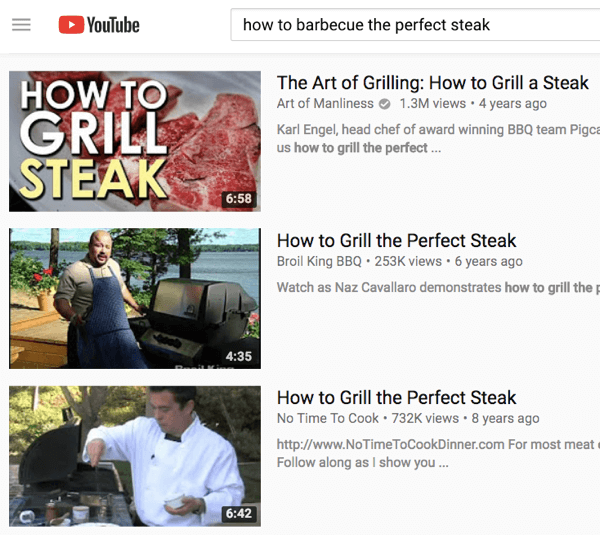 YouTube videos with millions of views explain how to grill the perfect steak, how to heat up the perfect chicken, and so on. If the content creators allow advertising on their channels, your ad can show up right before those videos. Say something like, “Hey, it looks like you’re grilling steak. Well, if you do, I have the perfect product to make sure that you never burn your steak. Here it is.” You show your ads only to the people who are actually interested. If you have a grilling product, target people through ads on videos that relate to barbecue. To do this targeting, you need a Google AdWords account because AdWords controls all YouTube ads and the advertising within search. You can get a Google representative on the phone to help you get started or look at all of the resources out there such as tutorial videos. You can handpick videos you want to target or target people based on topics. When you target by topics, the algorithm does the work of picking videos for you. If someone frequently searches for topics about marketing and advertising online, Google will align the person with that interest. The third option is placements, where you can advertise on websites that allow video advertising. Say a blog post includes a video that’s hosted on YouTube. You can advertise on that video. Use this option when the website and your product are a good fit. For instance, if someone has a website that’s dedicated to people who love vegan food and you have a vegan product, you probably want to advertise heavily on that site. You can get started with placement ads by using the Display Planner, which is a free tool. Enter the subject “exercise,” for example, and it will generate a list of websites. Then you can view the sites and evaluate whether a site fits with your product or service. Display Planner is a free tool in Google AdWords. Billy Gene says videos tend to perform better on YouTube versus on websites. However, a couple of websites that he never thought would have conversions perform well. As you begin to play with advertising, don’t assume. Assumptions mean nothing because you don’t know until you test. I ask about geofencing for local businesses, and Billy Gene says you can target within a mile or two of a zip code or address, and also add layers. For instance, say you have a chiropractic business. You can advertise to people within a five-mile radius (because no one’s going to commute farther than that), and to people who are actively searching for how to remove or alleviate lower back pain. After you create an ad once, it becomes an asset that will bring you customers again and again. Plus, after you enter your targeting criteria in Display Planner, it tells you on average how many searches the criteria are getting every month. Listen to the show to hear Billy Gene discuss how valuable YouTube’s free tools are. Before you start your script, map out who your audience is, as well as their problems and your solutions. 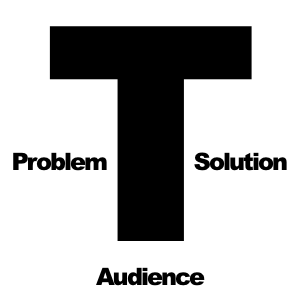 To create a script, take a blank piece of paper and draw a giant T. On the left side, write “problem.” On the right side, write “solution.” At the bottom, put “audience.” In the audience section, identify who’s most likely to buy your product or service. Is it a woman? A man? How old are they? What TV shows do they watch? What magazines do they read? Don’t know the answer? Look at your customers over the last three years to find out. After you understand who’s most likely to buy your product or service, identify the five greatest pain points they’re going through and how your product or service solves those. After you figure those out, pick the one you believe applies most and gets them the most emotional. Your video script goes as follows: First the introduction, which is a cool, creative way to show up on camera to grab their attention. Then you want to make them a promise. Returning to the chiropractor example, Billy Gene says the promise sounds something like, “If you’re dealing with extreme back pain, in the next two minutes, I’m going to show you four different exercises that you can do while sitting down to alleviate the aches.” You can do a similar video, focusing on neck pain. After you have the introduction and the promise, demonstrate how you can solve this problem. This low-resistance call to action is something like, “If that feels better immediately, imagine how much better you’ll feel when I invite you into my office, which I’m in right now.” Show yourself demonstrating the product or service on a potential customer. Then make an offer. For instance, say, “Come in right now. Click this ad and come in by this date. I’ll adjust your back for free.” With the offer, you provide a quick win for the potential customer. Listen to the show to hear how to close your ads with an effective call to action. YouTube makes bidding pretty easy. Go in and put the amount of money you’re willing to pay, which realistically is like $.05 or $.07 per view. The way to lose on YouTube is to get so obsessed with content that you forget to tell people what to do at the end of the ad. If someone doesn’t click your call to action, they’re redirected to the video they were initially searching for and will forget all about you. Listen to the show to learn what makes ads expensive. 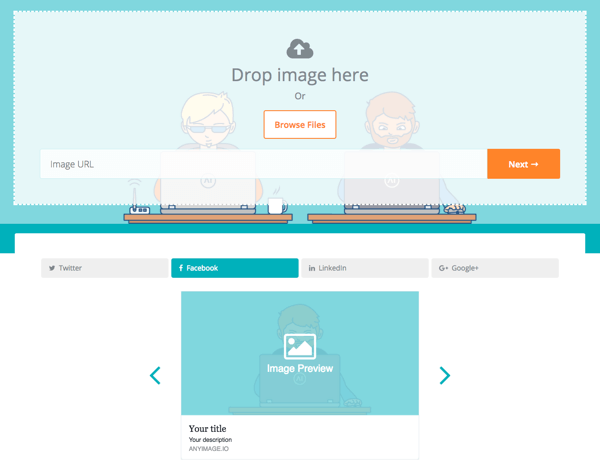 AnyImage is a cool tool for posting images to Twitter, Facebook, LinkedIn, or Google+. Customize what images show in your social feeds with AnyImage. This browser-based tool is especially helpful for anyone who wants to post images as social cards but doesn’t have access to the back end of their website. Listen to the show to learn more and let us know how AnyImage works for you. Learn more about Billy Gene Shaw on his website. Follow Billy Gene on Facebook and subscribe on YouTube. Get a flash drive with Billy Gene’s agency’s best-performing Facebook ads. Take a look at Billy Gene’s membership site and the School of G.E.N.E.I.U.S Facebook group. Watch Billy Gene’s The Wolf of Wall Street parody. Try Twilio, ClickFunnels, and Slybroadcast. Get music for videos at AudioJungle and Artlist.io. Take a look at Display Planner. What do you think? What are your thoughts on YouTube pre-roll ads? Please leave your comments below.